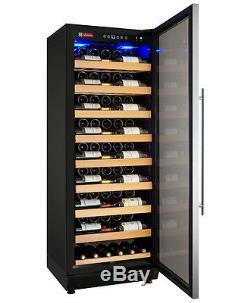 115 Bottle Single Zone Wine Cooler Refrigerator Stainless Steel Glass Door. 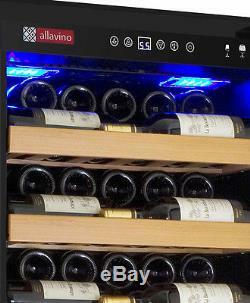 The Allavino YHWR115-1SRN Vite Series Single-Zone Wine Refrigerator is an elegant and convenient wine cooler that is an ideal choice for wine aficionados with a diverse collection. This wine cellar features a black cabinet, a stainless steel framed glass door on a right hinge, stainless steel curved and towel bar handles, and blue LED interior lighting. Wine cooler includes an activated charcoal air filter, fan-forced cooling, and a single zone temperature control with a range between 41°F and 73°F - one of the largest temperature ranges available on the market. Allavino's wine refrigerator comes equipped with 8 adjustable hardwood shelves that are capable of storing and cooling up to 115 bottles of wine at one time. These shelves are adjustable in 1 1/4 increments to allow for maximum compatibility with varying bottle sizes. The all-new Allavino Vite Series YHWR115-1SRN Wine Cellar Refrigerator is an ideal choice for wine aficionados with a diverse collection. Since there is no longer a "standard" bottle size and many collections feature bottles with different diameters, this wine cooler refrigerator was designed with flexibility in mind. Due to the adjustability of its extra thick glide out shelves, you can configure the interior to suit your specific collection, whether you have Bordeaux, Burgundy, Pinot Noir, Chardonnay, Champagne or a mixture of everything. Single-Zone Digital Temperature Control: Featuring digital temperature display with push button controls, operating a wine refrigerator has never been easier. 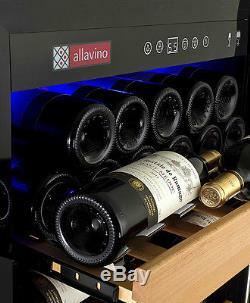 The Allavino YHWR115-1SRN has one of the widest available temperature ranges in the industry and can be set low enough to serve white wine or high enough for long term storage of red wine, depending upon the needs of your specific collection. The lighted display is easily visible through the glass, so you can monitor your temperature without opening the door. 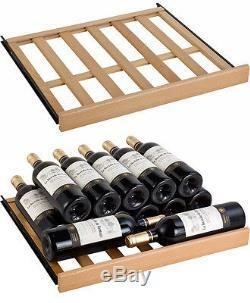 Easy Rolling Hardwood Shelves: Each of the 8 extra thick, easy glide wood shelves can hold up to 13 wine bottles. The standard spacing allows for a maximum capacity of 115 bottles, but if you have larger diameter bottles, you can conveniently adjust the shelves in 1-1/4 increments to accommodate them. Larger bottles will affect the overall bottle capacity. Cool Blue LED Interior Lighting: The cabinet boasts two light panels to showcase your wine collection in contemporary fashion. The cool blue LED lights cast a soft glow on your bottles, stylishly illuminating them without the unnecessary heat created from an incandescent bulb. Tinted Glass Door with Lock: The UV-protected, argon filled, double pane thermal insulated glass keeps harmful light away from your wine and provides maximum insulation and viewing capabilities. The built-in key lock keeps your collection secure. Two keys are provided so you will have a back-up. Both towel bar and curved door handles are included with this unit so you can chose the style that is most comfortable for you and most consistent with the design of your home. A magnetic gasket is provided to ensure a tight seal. Fan-forced cooling: Allavino Vite Series wine refrigerators include an internal fan that circulates air in the unit for more even cooling throughout the cabinet. This helps to prevent large differences in temperature between the upper and lower shelves and reduces initial cool down time by 50%. 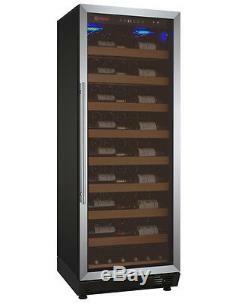 The temperature can be adjusted between 41°F and 73°F, a wider range than most other wine refrigerators on the market. Black Cabinet with Stainless Steel Framed Glass Door with Right Hinge. This model includes both the Towel Bar and Curved Handles to allow you to choose which option works best in your environment. 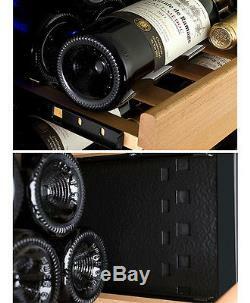 8 adjustable sliding shelves - Adjustable in 1 1/4 increments to allow for maximum compatibility with varying bottle sizes. 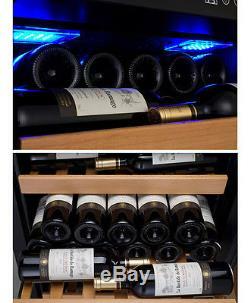 Blue LED Interior lights - Beautifully illuminates your wine collection and makes bottle selection easy. Activated charcoal air filter - Helps to prevent unwanted odors from entering the cabinet, which could penetrate the cork into your wine. Single temperature zone - Store either red or white wine. 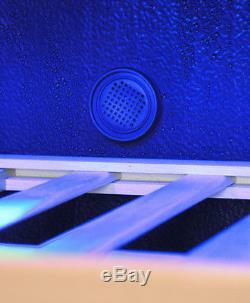 Fan-forced cooling - Reduces the hot and cool spots in the unit, promoting even temperatures, yet is quiet with the door closed. Temperature adjustable between 41°F and 73°F - one of the largest temperature ranges available on the market. Ambient Temperature Range: 55-80°F If the ambient temperature is above or below this range, the performance of the unit may be affected. For example, placing your unit in extreme cold or hot conditions may cause interior temperatures to fluctuate. Magnetic Door Gasket ensures tight seal. 175 W motor 0.95 KW. Unit dimensions: 64 3/8" H x 23 1/2" W x 23 1/8 D w/handle. Packaging dimensions: 67 1/4" H x 26 1/8" W x 24 182 D. Important Note: To reach the maximum stated bottle capacity, the bottles must be no wider than 3", no taller than 8 1/2" at the shoulder and no taller than 11 3/4 overall. The bottom rack must also be removed to allow a second row of bottles in the bottom area, as shown to the right. The unit will fit 13 bottles on each of the 8 sliding shelves (11 bottles with the neck facing backward and 2 bottles sideways in front), and either 6 bottles on the bottom rack, or 11 bottles in the bottom area with the rack removed. Larger bottles will decrease the bottle capacity. Vite, the Italian word for grapevine, represents the very essence and origin of wine. The Allavino Vite Series Wine refrigerators feature some of the latest innovations in wine storage. 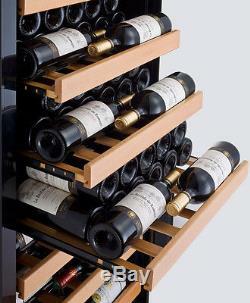 They have been designed with the collector in mind and have essential features for wine enthusiasts with diverse tastes. Revolutionary New Racking System: Each unit features extra thick hardwood shelves that support the weight of multiple rows of bottles, allowing you to fit more bottles in the space provided. Each of the shelves glide out far enough to access the rear bottles so no bottle is out of reach. With maximum flexibility in mind, the shelves were designed to be adjustable so that collector's with varying bottle sizes would not be limited to the amount of space they have on each rack. You can set them close together to achieve the utmost capacity in the space provided, or you can set them apart to accommodate large diameter bottles. The beautiful wood finish will complement any decor. Professional Level Cooling: The Vite Series features internal fans in every model, which helps to prevent large differences in temperature between the upper and lower shelves and reduces initial cool down time by 50%. The single zone units feature a temperature range adjustable between 41°F and 73°F, a wider range than most other wine refrigerators on the market, and the dual zone unit allows users to store both red and white wine simultaneously. An active charcoal filter helps keep unwanted odors out of the cabinet. Classic Design Features: Each unit features digital display with push button controls, high quality thermal insulation on both the cabinet and door, UV protection on the glass to keep harmful light away from your prized possessions and key locking doors to ensure no one touches your collection unless you want them to. With either black or stainless steel doors, towel bar or curved handles, single or dual zone options and capacities ranging from less than 100 to over 300 bottles, you are sure to find a model that fits your style. 21 1/2 (23 1/8 w/handle). Drivers do not assist with unpacking, set-up, or clean up. Packages are sent Signature required. It is important to save all packaging and not destroy boxes in case of a return. We offer unique products to make, store and dispense your favorite beverages! We bring over a decade of experience and knowledge from the brewing and beverage industry online. From our extensive line up of kegerators and wine storage units, to our water dispensers and draft beer parts, you'll find our specialized selection of beverage equipment second to none. We're committed to continually bringing unique and exciting beverage products and appliances to you at great low prices. In addition to our great product selection and low prices, we believe in direct access customer contact. When it comes to sales & service, we promise. We try to offer the prices will be the best anywhere. Our goal is to provide a source where home owners, business owners, aficionados, and hobbyists can find beverage equipment and hardware to fulfill their particular needs. So whether you're building a home bar, designing a custom wine cellar or looking for a special gift, Beverage Factory would love to earn your business. The Beverage Factory 8510 Miralani Dr. 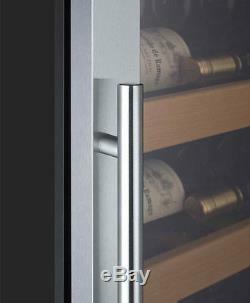 The item "115 Bottle Single Zone Wine Cooler Refrigerator Stainless Steel Glass Door" is in sale since Monday, October 12, 2015. 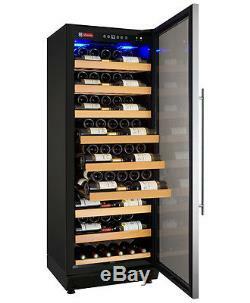 This item is in the category "Home & Garden\Kitchen, Dining & Bar\Bar Tools & Accessories\Wine Fridges & Cellars". The seller is "beveragefactory" and is located in San Diego, CA.